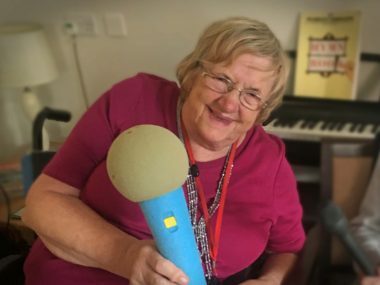 Radio Here & Now is a unique creative activity for those living in residential care. It's all about telling stories, jogging memories and stimulating conversation. 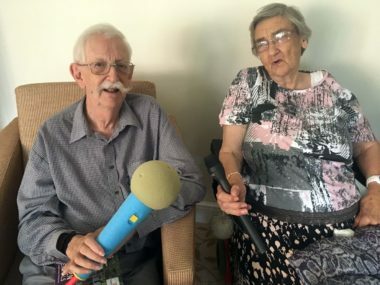 It's designed primarily for elderly people who have a very special relationship with radio. It's what they grew up with and it brings back so many memories. 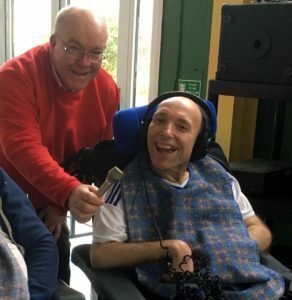 In a flexible session ( lasting between an hour and 90 minutes) we create a radio programme, run quizzes and even have a go at making sound effects. It's amazing what you can do with coconut shells and wet celery! 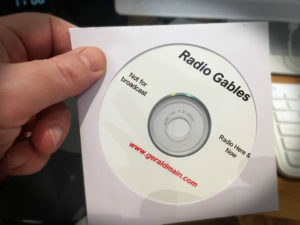 By the end of the activity, we have all the ingredients to build our own "radio programme" which, after a little bit of editing, is ready to play back on a CD .... again, and again, and again! The programmes are not made for broadcast ... just for the fun of it. Call Gerald Main for more details on 07736480342 or email gerald@geraldmain.com . Here's a taster from a recent recording. It's a group activity for between 6 and 20 people. We use audio to stimulate conversation and jog memories. There are music quizzes, fun with sound effects and we record the ingredients for their own show including their favourite music. That's what one Activities Coordinator asked! 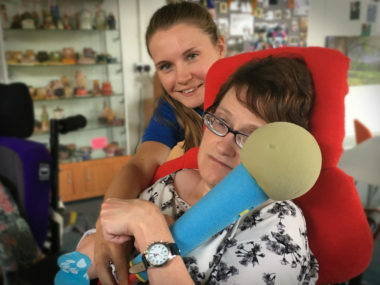 It's certainly "meaningful activity" ... it involves a degree of technology and it can be tailored to involve those residents who can't or won't leave their room. Will it be broadcast on a radio station? No, it's just for the fun of making a programme and sharing the results with residents, friends and family. Will we get a copy? Yes, within a couple of days of the session you will receive a CD for playing to the residents. You'll also have access to a private online link from where the programme can be downloaded for 28 days. Do you charge for the sessions? Yes, fees are from £100 and include the production, packaging and postage of the CD. 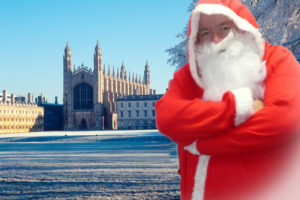 I am based in East Anglia and make a small charge for travel. 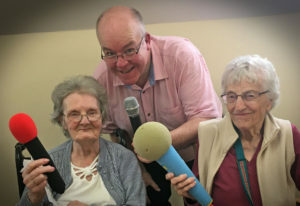 Enjoy a recent programme presented by the residents at Davers Court in Bury St Edmunds. Lovely residents, great staff and a fabulous home! I'm Gerald Main and I've been in the radio industry since leaving school a long, long time ago. 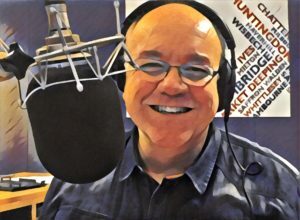 I've run radio stations for the BBC and these days present shows, lecture at universities, run media training sessions and coach broadcasters. Below is the first Radio Here And Now programme. Pour a brew, click the link and you will have a smile on your face (and possibly a tear in the eye) within minutes. Phyllis is a resident at The Gables, Chatteris in Cambridgeshire. 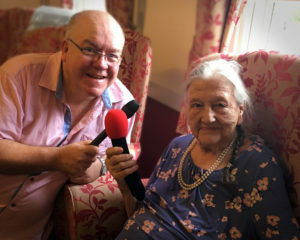 Aged 100, she is officially Radio Here & Now's Senior Presenter. 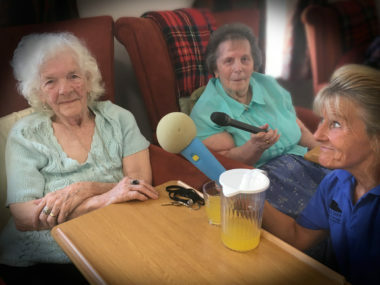 In a Radio Here and Now Santa Special, the memories and stories come thick and fast. We create a Jingle Bell Orchestra, race reindeer, enjoy a Christmas music quiz and create a truly festive radio show full of festive favourites. Book early! 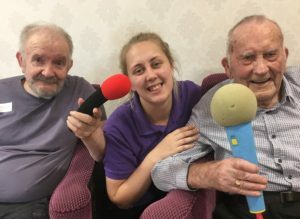 Radio Here & Now was originally designed for elderly people living in care. 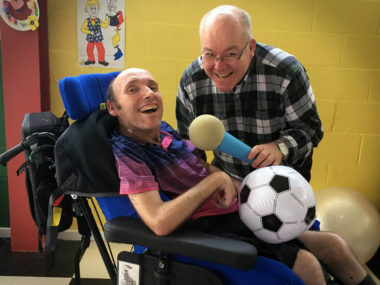 However, I wanted to show the concept worked in all residential settings and have recently run sessions for people with severe physical and learning disabilities. 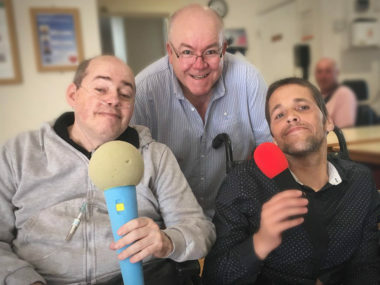 Despite some members of the group being unable to communicate using speech, a remarkable programme was produced. You can hear a clip from that event below. Feel free to contact me if you would like to listen to the programme in full. Contact me for more details 07736480342 or by email gerald@geraldmain.com . Laughter is a key element of Radio Here & Now. 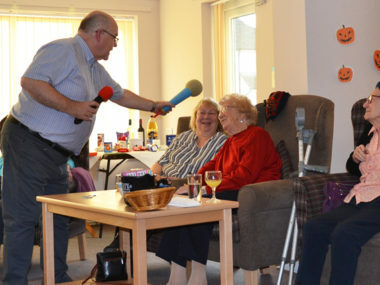 Each session throws up a golden moment and below is one from a recent visit to a home for the elderly in Norwich. Radio Here & Now has become very popular very fast. Most homes ask for a return visit immediately after their first session. 2018 is now fully booked, but I'm now taking bookings for 2019 ...with one for Christmas 2019 already booked! 9th August The Gables, Chatteris, Cambs. Radio Here & Now ensures everyone is involved. 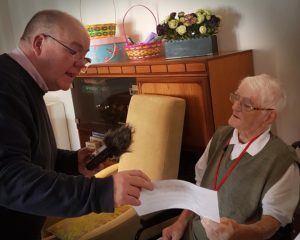 Not only is there a fun workshop, but within a couple of days the home receives a CD of the "radio programme" to play to the residents. There's also an online link to the programme which can be shared with friends and relatives. 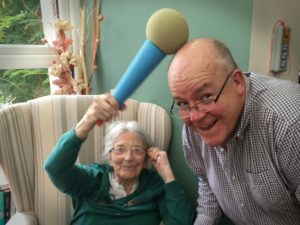 A regional dementia lead for one of the UK's biggest care providers said, "This is one of the most innovative sessions I've seen for a long time." 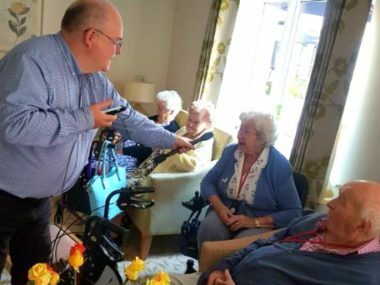 I'm delighted to have been commissioned by Black Swan Care to run Radio Here & Now sessions at all their homes in East Anglia. 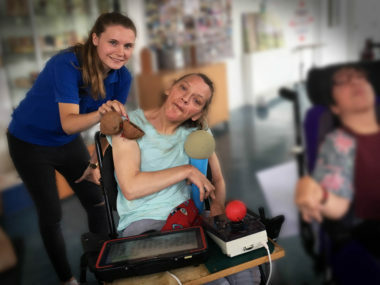 They care for the elderly and for people with a range of needs including those with physical and learning difficulties and dementia. It's great to being working with such an innovative company which wants to expand the range of activities on offer for their residents. 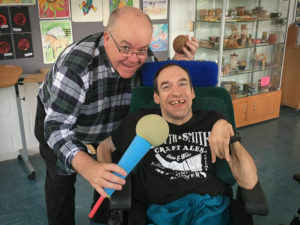 Picture: Howard, a resident at Drummonds in Essex, created brilliant sound effects for an exciting radio drama entitled, "The Night The Circus Came To Drummonds". My Talking Photos is for everyone who should write their life story, but probably never will. They put it off until it's too late and all those memories, family stories and experiences are lost. My Talking Photos is a new and innovative way of sharing those stories quickly and with a minimum of effort and preparation. It's also much more affordable than publishing a book. Simply choose a selection of photographs that bring back special memories and leave the rest to Gerald. You can discover more on My Talking Photos website. Here's an example of what we do.